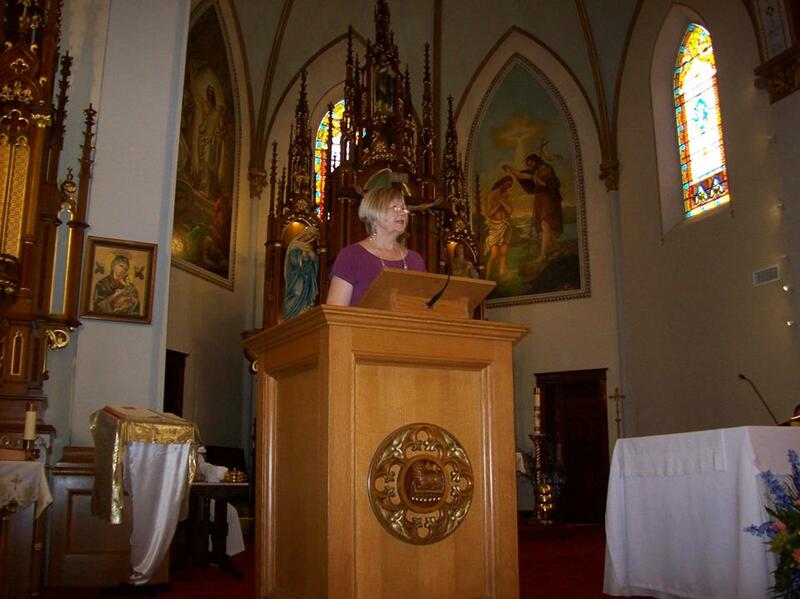 JOHNSBURG – The parishioners of St. John the Baptist Roman Catholic Church, who along with the Rockford Diocese have taken the utmost care in preserving and restoring a century old church in Johnsburg, will receive a historical plaque in a public ceremony Sunday, June 29. The McHenry County Historical Society and its Historic Sites Committee will plaque the church, located 2302 W. Church St. in Johnsburg, at noon. St. John’s story begins in 1841, when McHenry County was only 5 years old. During this time immigrants from Germany, began arriving in this area. Finally free from religious persecution, a small group of the newly-arrived Germans –Nicolaus Frett, Nicolaus Adams, Jacob Schmitt and Johann Baptist Muller – organized one of Illinois’ first Catholic parishes, St. John the Baptist, in what was then called Miller’s Settlement. In 1842 the first St. John the Baptist church was erected, a log cabin, which also served as a meeting hall and the first Catholic school in McHenry County. The first priest to serve this new congregation was delivered there by friendly Indians who found him lost in the woods of Wisconsin. In 1850 the log cabin was replaced by a larger frame church and by 1852, St. John's acquired its first resident pastor, Father Jacomet. German Catholics near and far depended upon St. John’s parish for services in their own language. St. John’s parish continued to grow and in 1867 work began on a third church. This new church was 50 by 133 feet and built of masonry, in the Gothic style so popular in Germany. It took 13 years took to complete the new church. During this time the village of Johnsburg was platted in June of 1868. Twenty years after its completion St. John’s, the pride of the Johnsburg community, was tragically destroyed by fire on Feb. 19, 1900. So devastating was the fire that many grave markers of the early settlers, in the adjoining cemetery, were destroyed. Two months later, on the same exact site as the three previous churches, work began for the construction of a new and even grander church. Amazingly, in less than 2 years a magnificent new St. John the Baptist Church rose from the ashes and was dedicated in 1902. The original building plans, architects and tradesmen’s names have long been lost. Word has it that many of the parishioners, German immigrants helped build today’s church at the cost of approximately $90,000. That’s nearly $2.5 million in today’s money. St. John the Baptist church truly symbolized the power of the builders and the strength of their religion. It clearly is a landmark building, rising high above all the surrounding structures. Surmounted by two spire like steeples and five side towers, this cathedral, was the skyscraper of McHenry County. The steeples and towers are decorated with floral finials and topped off with ornate crucifixes. The main steeple rises up 159 feet, which, at one time, served as a clock tower, has gargoyle water spouts and houses a working belfry. The bells, with their original wood cartwheels still attached, are dated 1900. They were cast in St. Louis, specifically for St. Johns, and are rung on a daily basis. The traditional Gothic trefoil symbol can be seen on the gabled areas of the steeples and over the main entryways. High above the main entrance is a beautiful circular, or “rose,” window very typical of Gothic design throughout Europe. Like most cathedrals and great churches, St. John’s is of a cruciform, or Latin cross, ground plan. The large narthex, or lobby, displays church information, houses a small shrine with votive candles, and is separated from the nave, or main cathedral, by a glazed and paneled oak partition. This area also gives access to a curved choir loft staircase. At the top of the staircase is a small gathering area with access to the belfry service steps and the choir gallery, look up and the bell rope holes are still visible. The choir gallery, bathed in warm suffused light from the rose window, houses the large pipe organ, air compressor room and access to the attic. Enter the nave, or main body of the church and the first thing that strikes you is the elevation, more so than the horizontal space. Here you find the defining characteristics of Gothic architecture, the pointed, ribbed arch. The intersecting ribbed vaultings, more than 40 feet tall, are supported by larger, cluster-style columns. General lighting is provided by eight, very large pendant lights. High above the arched ceiling, out of the general public’s eye, is a complex superstructure of rafters, hand-hewn beams, huge steel turnbuckles and meandering catwalks. Another Gothic feature of St. John’s is an ambulatory path that allows the guests to walk around the interior of the main chapel and view the magnificent clerestory stained glass windows adorning the high-rising exterior walls. The beautiful, and highly valued stained glass windows, hand crafted in Germany, embellish the church with vivid colors and warm ambient light. There is no doubt that St. John the Baptist church is a high quality built structure, but looking this good, at 112 years old, comes at a great monetary cost. In 1975 and 1992 major repairs and restoration had to be performed, and once again, repairs are necessary today, such as a beautiful, long lasting and expensive, copper roof presently being installed. We salute the parishioners of St. John’s, the Rev. Jacek Junak, Bishop David J. Malloy and the Rockford Diocese for their hard work and determination in keeping this parish church maintained current and future generations to enjoy. Winston Churchill said “First we shape our buildings; thereafter they shape us." This is very true, especially here in McHenry County. Unfortunately very few of us in McHenry County know the historical background of the buildings around us, the buildings that shape us, such as St. John the Baptist church. Your McHenry County Historical Society is working to change that.